Carl Catron did an amazing cover of the Song of Storms, but it isn’t what you expect it to be. He played it on the saxophone, adding a jazzy sound to the classic song from Ocarina of Time. It is masterfully done and has shown his skills well. The Song of Storms is great and I will always remember the tune, especially the paradox involved in its learning. Check out the song after the jump! 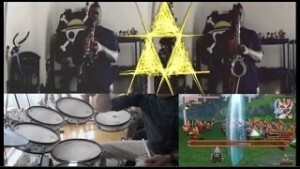 What did you think of this cover, and what other Zelda songs would be good to see from him in the future? Drop a comment below sharing your thoughts.